The kids will love a visit to the Jardin d'Acclimatation, an amusement park on the outskirts of Paris, set in the beautiful Bois de Boulogne. 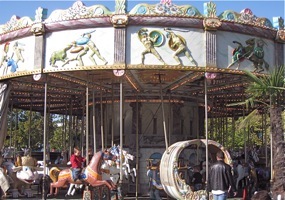 Childhood reigns supreme at the 20-hectare (49-1/2-acre) Jardin d'Acclimatation, or children's amusement park, at the northern extent of the Bois de Boulogne, in Paris's neighboring city of Neuilly-sur-Seine, to the west. Kids can ride on a miniature train, try the rides in an amusement park, tour an old-time French farm, see puppet shows, visit an aviary and a zoo, go for a pony ride, and play on numerous fun and creative playgrounds, designed for children of different ages. And of course there are also a couple of carousels. The Exploradome offers hands-on science workshops (for a fee). The Jardin d'Acclimatation is especially popular on Wednesday, Saturday, and Sunday when special programs and activities are arranged and families come out to enjoy the park. Note that there is a small entrance fee. There are plenty of free playgrounds and activities, but things like amusement park rides, bungies, and trampolines all carry an extra charge, which can range from about 3-7€, depending on the activity. Many of the rides are near the Sablons entrance, so you may want to head directly for the farm or playground. The Jardin d'Acclimatation also offers several restaurants, from fast food to full meals served on white tablecloths. Métro: Les Sablons, then a six-minute walk. 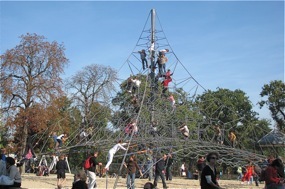 Above: Kids on giant play structure, Jardin d'Acclimatation, Paris.